ObjLoader is used to load sequence obj files. *Fixed some bugs of buffer and add rotation offset function. *It can load sequence obj files. *Support each obj file with different structure. *It is in [Create>Geometry>Scripted Primitives]. The OctaneQueue script makes possible the Render Queue with Octan Render for 3dsMax. I've translated the Queue by an animated camera: the Camera Queue. The Octane Queue script finds all the cameras in the scene (they must have the defoult Octane Render Camera name) and their Target. The Octane Queue generates the new Camera Queue and animates it on the position of all the Cameras in the scene. In order to start the Render Queue the user must render the animation of the CameraQueue. This code saves, and find the LAST SEQUENCE number in the file name to automatically increment. This works especially with names with suffix after the sequence number. With this tool you can save custom frameranges and quickly cycle betwen them. Also has control over the Frame tags, and lets you easily queue tag times which you need to get rendered. This script will render out via "Preview - Grab Viewport" for multiple cameras at once. 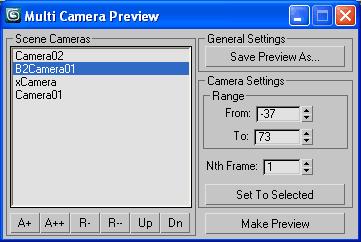 Useful if you create preview cameras a lot, or need to make multiples at once. 2. In Max goto "Customize->Customize User Interface...->Toolbars tab->Category: ColinScripts->OpenGL Previews" and drag "OpenGL Previews" to a toolbar, click to run. A script asked in the forum. A tool with self explained interface. - Includes support for tweaking the sun/sky system hours and days, to select the entire assembly you need to use the "Pick List" button. - Includes minor UI tweaks, like the ability to not display all of the images after the renders are done, thanks for the suggestion Br0t.